This is a delicious summer salad served at our hotel in Laos. The dressing was cooked in a wok and then poured over the salad. Heat wok add oil, garlic, onion, fish sauce and stir 15 seconds stirring constantly. Now add the egg yolk mix until it disappears into sauce. Now add sugar and lime juice, stir. Pour over mixed greens and herbs top with chopped nuts and serve at once to ensure it does not wilt. Enjoy with a great piece of fish from the grill. Just returned from an amazing trip to Laos. We started in the north in Luang Prabang. Our hotel” La Residense”, an Orient-Express hotel. The hotel was beautiful and the top of the line for Laos. Our guide, “See” was wonderful his e-mail is seelaos@hotmail.com, he will respond at once and speaks great English. See drove us to several local villages so we could experience how the people live day to day. We took toothpaste and small cookies to had out to the locals. The houses were thatched roofed single room structures with dirt floors. The adults were working in their fields getting ready for the rainy season and the planting of the sticky rice. Each village had gardens with beautiful lettuce and greens. We found them eating frogs, roasted rats, small birds and dried fish plus many greens. The sky was full of smoke from the burning of the hill sides undergrowth. 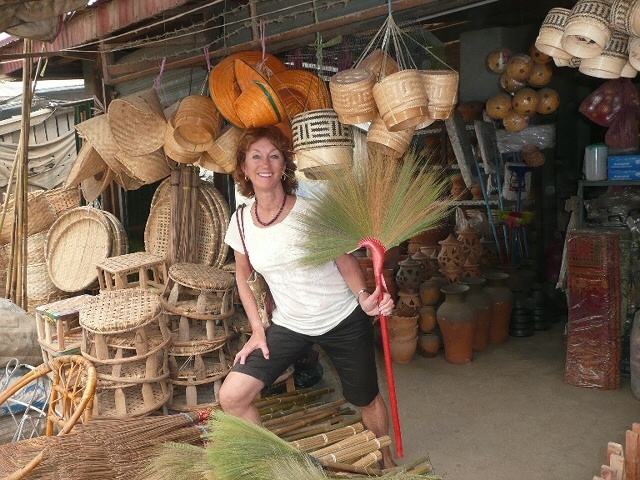 The city of Luang Prabang was busy with small shops, a huge night market and many bed and breakfast places. We had a wonderful dinner at L’Elephant Restaurant after spending 2 hours at the night market. I loved all the green curry dishes with fresh ginger and lemon grass and lime leaves. Taking the river boat to see the Buddha cave, a long ride, 2 hours and a little over an hour back was to long. I would suggest driving up and taking a boat back. We did see many groups standing in the river panning for gold, very interesting, also stopped at a village known for their weaving. 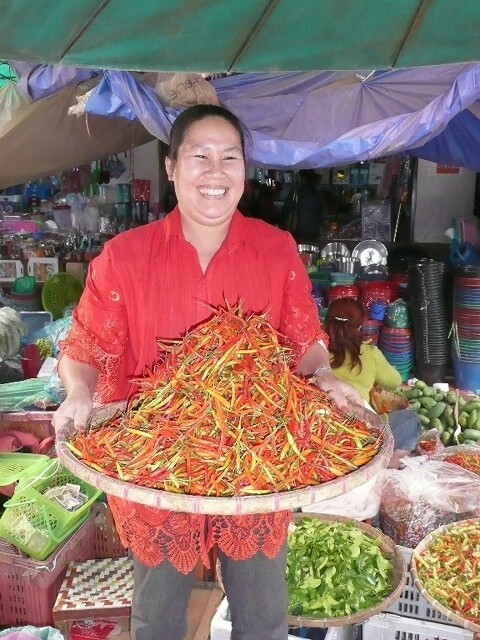 The temples are interesting but after two or three it is more interesting to go to the morning food markets. Ladies sitting selling a couple of things from their gardens, small tomatoes, fresh lemon grass, fish of every kind, fresh and dried, ant eggs in their nests, snakes in big barrels, frogs, gophers and many other odd things. We had an early dinner this night after the long river trip, our dinner at “3 Nagas” sitting outside was a good end to our stay. The 3 Nagas also has small hotel upstairs that looked nice. We enjoyed the evening the menu offered was very good and not expensive. The next day we were up early for our drive to Vientiane. “See” met us at the hotel and we headed south. After a visit to the Phosy market we drove 6 hours to Vang Vieng, a hippie village in the mountains. We stayed at a small hotel on the river, “Thavonsouk Hotel’, $61.00 a night with a river view and breakfast of fresh fruit. Dinner that night was shared noodle dishes, fresh fruit plate for desert and including 3 glasses of wine, total $15.00 for the 3 of us. Next day we had a 4 hour drive with a stop on top of the mountain at a place called “Phoukhon Restaurant” we shared great green curry and several local dishes. Lunch was $12.00 including a couple of beers and bottled water. See stopped any place we wanted to take a picture or stretch. His large van had good air conditioning so the ride was easy. Once we were back on the road we stopped in a village to see the local Khamu children dressed for a party, and they were excited to have their pictures taken. When we arrived in Vientiane we checked into the hotel, Greenpark Boutique Hotel, info@greenparkvientiane.com, $140 a night, one of the few hotels with a pool. The pool was wonderful after a day exploring the city. We did not encounter very hot weather, most days were in the low 80’s but the smoke was thick until we arrived in Vientiane. Vientiane is a large city, the capital of Laos, but most of the attractions focus on the beautiful temples, our favorite was Vat Sisaket. Next was the Victory Gate called Patuxai, and their market held in 3 story building selling all kinds of jewelry, clothes and stuff. Remember to bargain starting at least 50% less than the asking price, you will usually settle some place in between. Lunch was at a nice outdoor cafe Khop Chai Deu. For dinner we met JoJo and Bruce at Hotel Settha, the other hotel with a pool. Jojo is a food blogger,Jojo-laos.blogspot.com, and Bruce is teaching English at the local college. 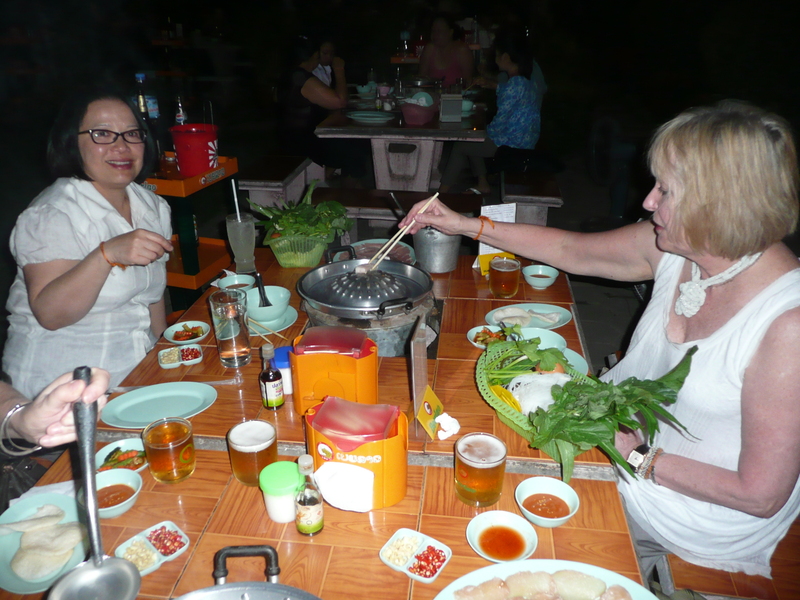 It is great being with locals who wanted to share the fun BBQ style cooking they call Sindat. The Sindat is served in a garden with buckets of charcoals placed in the center of the table, a hole cut in the table to accomodate the lowering of the bucket and a cover that resembles a hubcap with holes is placed on top of the hot bucket. You lay pieces of meat on the rounded surface of the cap and broth is poured into the shallow rim and then a wide assortment of greens are placed in the broth. We had a great time sharing dinner with a few local beers, total dinner for 5 was $20.00. Be sure to follow Jojo’s blog it is very interesting and she is planning on organizing cooking classes close to here home in Vinetiane. May be a trip in our future. Next day we walked the river, visited the showroom of Carol Cassidy, local weavers sit and create the most beautiful shawls, table runners and spreads of beautiful designs, a must see. Later we went to see the new museum and school for COPE, Coop for Prosthetic, amazing what these people have suffered for years. Dinner was at a French restaurant called “Le Silipia” it was a nice change after a week of Lao food. Next morning two of us flew south to Savannakhet. This city has not seen very many Americans but we loved our visit. It was very hot and the city is like going back in time, maybe to 1945. We stayed at a new hotel ” Daosavanh Resort and Spa” info@daosavanhht, the deluxe rooms were large and clean for only $78.00 a night including breakfast. The large pool was a fine plus after our 4 hour bike ride through the city. The hotel had the bikes and since the city is so flat we found it a perfect way to tour the city, including the amazing fresh market. They were selling everything, not a place for the faint at heart. The spa at the hotel was amazing a 3 hour service was $20.00 and you could not have had a better service in the best American spa. The hotel tuktuk took us to our dinner at a place on the Mekong river, “Lao Lao Der”, good choice but remember the locals eat very spicy food so be careful when you order. Our experience was one that I will never forget and look forward to my next visit. If you have any questions please let me know. I will post some images soon.